You may be mistaken for an angel wearing Valeria. This open back wedding gown is supported with spaghetti straps. 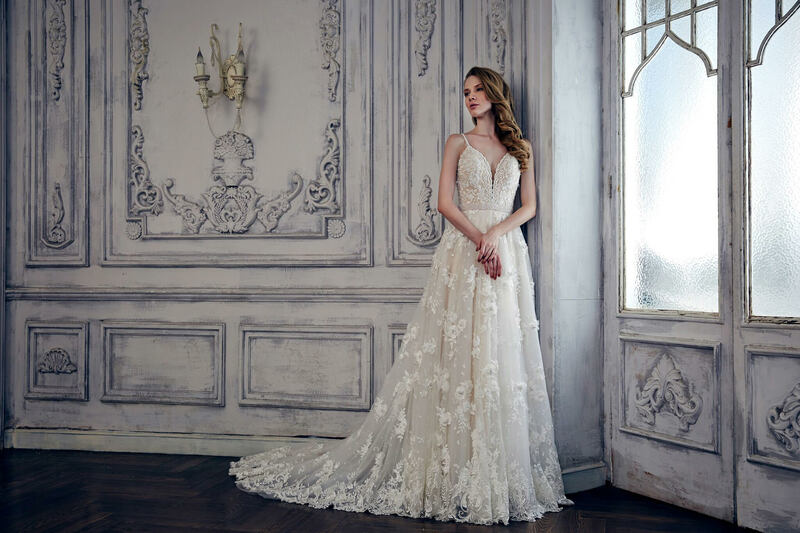 The deep plunging sweetheart neckline holds a scallop trim and the whole sheer bodice is accented with curly and floral embroidery. A beautiful beaded belt sits at the natural waist, defining your curve to a slim figure. Pretty flowery embroidery sweeps down the full length skirt, centered with sequins and pearls. The hemline of the chapel train and A-line skirt is trimmed with embroidery. Every guest will gaze with amazement by how beautiful you look in your A-line beaded embroidered bridal dress.